Deadly encounters between police and black citizens in recent years have led to a vigorous debate across the U.S. over police conduct and methods. A new Pew Research Center nationwide survey of 7,917 police officers in departments with at least 100 officers, conducted by the National Police Research Platform, focuses on a wide range of topics about policing, including how police view their jobs, officers’ experiences in the field and how these fatal encounters have impacted the way they do their jobs. Here are key takeaways from the new report. 1 Most officers – 86% – say high-profile incidents between blacks and police have made their jobs harder. Roughly nine-in-ten (93%) say officers in their department have become more concerned about their safety, while about three-quarters say that their colleagues are more reluctant to use force when appropriate or to stop and question people who seem suspicious. Three-quarters also say that interactions between police and blacks have become more tense. 2Black and white officers differ over perceptions of fatal encounters and ensuing protests. 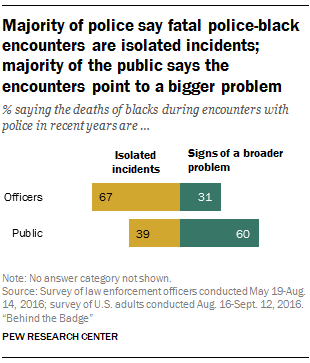 About seven-in-ten white officers (72%) say that the deaths of blacks during encounters with police are isolated incidents rather than signs of a broader problem. By contrast, 43% of black officers say these are isolated incidents, while 57% say they are signs of a broader problem. When it comes to the protests that have often followed these deadly encounters, white officers are more skeptical of the protesters’ motives: Only 27% say at least some of the motivation for these protests is a genuine desire to hold officers accountable for their actions. Among black officers, 69% see this as a motivating factor. And on the issue of race relations more generally, white and black officers have profoundly different views: While 92% of white officers say the country has made the changes needed to give blacks equal rights with whites, only 29% of black officers agree. 3 Police work is marked by conflicting experiences and emotions. While about six-in-ten officers (58%) say they nearly always or often feel proud about their work, about half (51%) say it always or often makes them feel frustrated. Officers also report that they encounter a range of reactions from the public. About eight-in-ten (79%) say they have been thanked by a community member for their service in the past month. But two-thirds say they have been verbally abused by a community member during the same time period. Many officers – 55% – say they have had both experiences. 4While physical confrontations are not part of the daily routine, a third of officers say they have struggled or fought with a suspect resisting arrest in the past month. Whether they’ve struggled with a suspect or not, the vast majority of officers say they have serious concerns about their physical safety at least sometimes when they are on the job. Some 42% say they nearly always or often have serious concerns about their safety and another 42% say they sometimes have these concerns. Most police officers (72%) say that, outside of required training, they have never fired their service firearm while on duty; some 27% say they have fired their weapon in the span of their career. Men are more likely than women to say they have ever fired their service weapon (30% vs. 11%). Among white officers, 31% say they have ever fired their service weapon while on duty. Fewer black (21%) and Hispanic (20%) officers say they have done so. 5 Police see value in knowing the people and places they patrol, but are divided when it comes to the use of more aggressive tactics. More than nine-in-ten officers say it is at least somewhat important to have a detailed understanding of the people, places and culture in the area where they work in order to be effective at their jobs. And rather than viewing the neighborhoods where they work as hostile territories, about seven-in-ten say at least some of the residents share their values. 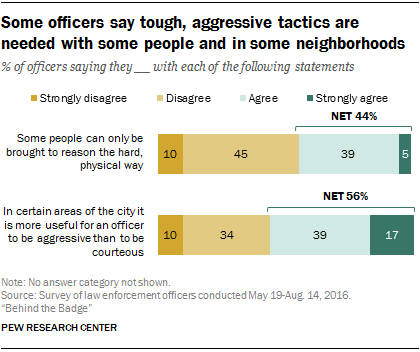 But a narrow majority (56%) agree that in certain areas of the city it is more useful for an officer to be aggressive than to be courteous. And a substantial share of officers (44%) agree that some people can only be brought to reason the hard, physical way. 6Most officers lack confidence in their department’s disciplinary process but view its use-of-force guidelines as appropriate. When asked about the extent to which underperforming officers are held accountable, only 27% of officers agree that in their department those who consistently do a poor job are held accountable. But officers are divided when it comes to the fairness of their department’s disciplinary process: About half (45%) agree that their agency’s disciplinary process is fair, while 53% disagree. But as many departments grapple with use-of-force policies and training, most officers (73%) say that their department’s use-of-force guidelines strike the right balance (26% say they are too restrictive and 1% say they are not restrictive enough). 7 The police and public hold sharply different views about key aspects of policing and issues related to public safety. While most Americans say they understand the risks and challenges that police officers face, the police disagree. Only 14% of officers say that the public understands these risks very or somewhat well, while 86% say the public doesn’t understand them too well or at all. But in a separate Pew Research Center survey of the general public, an overwhelming majority of U.S. adults (83%) say they do understand the risks and challenges that police officers face. The opinions of police and the public also differ on some important issues facing the country. While a majority of the police and public support some gun control measures, roughly one-third of police (32%) but 64% of the public favor banning assault-style weapons. And while 67% of officers say the deaths of blacks in recent encounters with police are isolated incidents, less than half of the public (39%) shares this view.